NEW ELECTRIC GOLF TROLLEY SALES. The Electric Golf Trolley store. 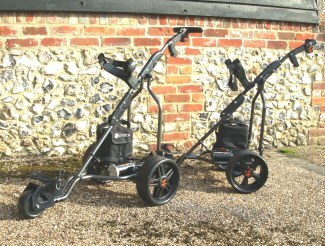 The G-TECH electric trolley range, UK electrics fitted as option. Tough, reliable and easy to use. Can buy without battery/charger, use existing. 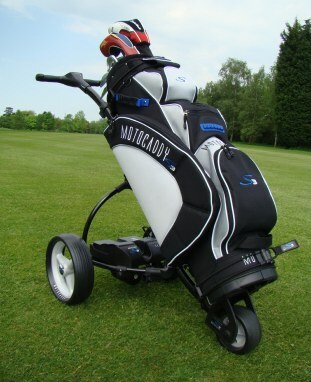 Secures the golf bag and takes your kit round the golf course with ease. Unfortunately won't tell the temperature, time and have flashing lights etc! No fancy gizmo's to let you down! Options1: Air tyres, 2 groove axle for easy free wheeling if you should forget your battery, or an unlikley trolley fault. Options 2: CDF a 30 second distance control button. Motocaddy, the best known of the import trolley, high build standards and strict quality control ensures a very high quality end product, again in various specs. S1 basic S1 Pro through to S3 digital, call us for deals part exchange whatever.